It’s no secret that the best way to prevent skin damage and premature aging is by using sunscreen. But we also know that the hours can pass by so easily laying by the beautiful heated, infinity pool at Casa Yvonneka or enjoying the outdoor living spaces at our luxury villa rental in Puerto Vallarta, and sometimes, before you know it….ouch!….you’ve managed to get a sunburn. 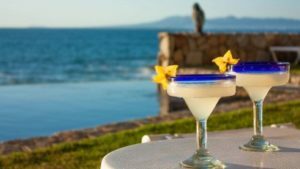 At Casa Yvonneka, it’s always our goal to ensure guests fully enjoy their luxury vacation with us, and we have a few post-sunburn skincare tips so that if you do happen to overexpose yourself to the sun, it won’t ruin your Puerto Vallarta holiday. And of course, the best course of action is to prevent a sunburn from happening at all, so remember to reapply often while you are enjoying your time outside and particularly after taking a swim in the sparkling pool of our luxury Puerto Vallarta vacation rental.